THE VISION - tallest and priciest condo in West Coast? 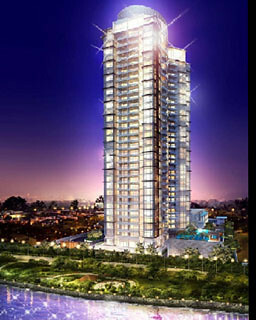 The Business Times has reported that Cheung Kong will launch THE VISION at West Coast Crescent this week. The Hong Kong developer plans to release no more than 100 units at the 99-year leasehold project, and the average asking price will range from $1000 - $1200psf. THE VISION comprises 281 apartments and 14 strata terrace units. The apartments will be housed in two towers – one with 33 levels and the other with 32. The project will be the tallest residential development in the area. It will have two-, three- and four-bedroom units ranging from 818 – 1604sqft. There will also be two penthouses. Going by the average asking price cited, a four-bedder could cost about $1.9 million. The target psf price tag for units at THE VISION looks high compared with those at developments nearby. Just next door is the 99-year leasehold Blue Horizon, which was launched around 2001. Units there went for $764 - $808psf last month, as caveats lodged show. Homes at Clementi-Woods Condominium in the vicinity changed hands at $836 - $957psf last month. It has a 99-year lease and entered the market in 2007. But Cheung Kong is marketing THE VISION as a high-end project in the West Coast area – and that probably shows in the asking prices. According to the developer, the construction cost is “high due to the quality finishes and high-end fittings used”. For instant, Cheung Kong says it will cost about three times more to build a bathroom in THE VISION than in a typical condominium. The developer says it is confident there will be demand because of several factors. For one thing, the site is across the road from West Coast Park, and about 70% of units will enjoy unblocked sea views. The area is also popular with expatriates. And this is a group which THE VISION is targeting, besides Singaporeans. BT understands that agents have collected cheques from potential buyers. According to a property consultant, THE VISION’s target pricing could be “a bit strong” for owner-occupiers. Investors would not mind paying, if they believe property prices will continue rising, but they tend to be more interested in one-bedroom units. If the launch is successful, it will set the benchmark for developments in the West Coast area. Do keep a lookout for our review of THE VISION in the coming weeks - the wife and I are certainly looking forward to those "costing three times more" bathrooms. No Comment to " THE VISION - tallest and priciest condo in West Coast? "